$50 minimum for withdrawals, 1.5% fee. 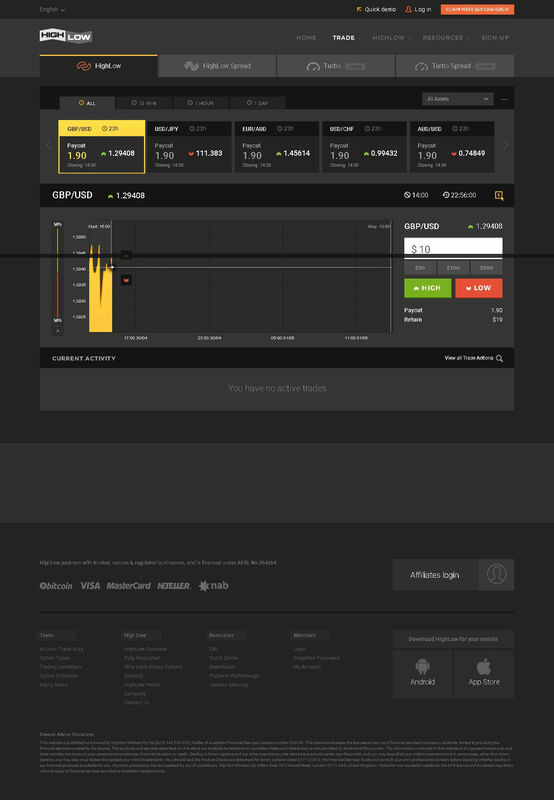 Spreads on High/Low Spread and Turbo Spread trade types. Perhaps one of the most innovative binary options brokers I have discovered in some time is HighLow. HighLow is run by the company HighLow Markets Pty Ltd., which operates out of Sydney and is regulated by ASIC (Australian Securities & Investments Commission) under license #364264. What makes HighLow different from other brokers? Well, along with a proprietary platform, this is a broker that takes a wholly different outlook on bonuses. I will tell you all about it and also go over HighLow’s other features and benefits below. Before you can start trading on HighLow, you must open your account. This is a bit more involved than you may be used to on other binary options websites. You must be prepared not only to provide your basic information, but also to verify your identity right away using proper documentation. If you are from the USA, unfortunately you are not allowed to trade on HighLow. While you are selecting your country, you can also choose a currency. Options include Euro, US Dollar, British Pound, and Australian Dollar. Numerous different deposit methods are available, including credit or debit card, bank transfer, bitcoin and a variety of e-wallets. The minimum deposit amount is just $50. Now, what is really cool about HighLow is the company’s program for promotions and loyalty. Instead of following the match deposit model with high turnover requirements which is nearly ubiquitous among binary options brokers, HighLow follows a method which has a lot more in common with the loyalty programs popular at online casinos. First of all, there is a system for earning points. Unfortunately, if all you trade each month is $10,000 or less, and you will not be able to earn points. But if you are trading more than that volume each month, you can earn between 3-10 points for every $10 you trade. These points can be redeemed for cashback rewards. Cashback rewards are also given out ad-hoc to traders at all levels. All new customers also receive a $50 cashback bonus when they place their very first trade on the platform. This is quite spectacular, and ultimately worth a great deal more than bonuses which tie up your money and cause you inconvenient elsewhere. Take note that there are no account brackets based on deposit amounts. The only differentiation between traders is the points tier they are allocated based on trading volume. There is a demo account you can use to practice trading, but no registration is required to access it. The biggest drawback with HighLow is that there really is not a lot to trade, both in terms of assets and types of trades available. To start with, I only counted 25 different financial instruments, which included currencies, commodities, and indices, but not stocks. Many other binary options websites allow you to trade hundreds of different assets. So this may be a bit restricting. The platform itself is easy to use and navigate, and includes a helpful feature called trader sentiment, which is a social trading indicator that shows you current trading trends as they are unfolding in the moment. Another handy trading tool is early close, which allows you to curb your losses when you think that trading conditions may be turning against you. While this is a common binary options tool, HighLow is a lot more transparent about its uses and limitations that most competitors. High/Low is the most basic type of binary options trade. Turbo is the short-term version of it. You will also notice that there are additional tree types called High/Low Spread and Turbo Spread. These are essentially the same, except that as the name implies, you pay a spread when you place these trades. Doing so allows you to receive a higher payout should you win—up to 200%. These high payouts are outstanding, and are among the best benefits of the site. As to the amounts you can trade, the minimum investment amount is $10, while the maximum investment amount is $2,000. This is a fairly standard floor and ceiling for binary options trading, and is ideal for traders with small or medium sized accounts. As to customer service, there is no live chat, which is certainly a drawback. There is a telephone number, and also a ticketing system which you can use to submit a request for help through a form on the contact page. Most of the binary options websites which I research and review all blend together, one into the next. This is because the majority of them are white label sites which have simply taken a popular platform (like SpotOption) and given it their own branding, and call that their product. They have not taken the time to innovate and do something different which offers unique value to traders. HighLow sets itself apart from that crowd. The promotions program this site has created is distinct from others, and is far more fair than the typical binary options bonus program. It truly does provide more in the way of value. If other binary options brokers would follow this model, it would probably improve the entire industry. This is not to say that HighLow does not have its disadvantages, but for the most part, this is a unique binary options broker with impressive benefits and features. If you are not in the USA, check them out; they may be an excellent choice.